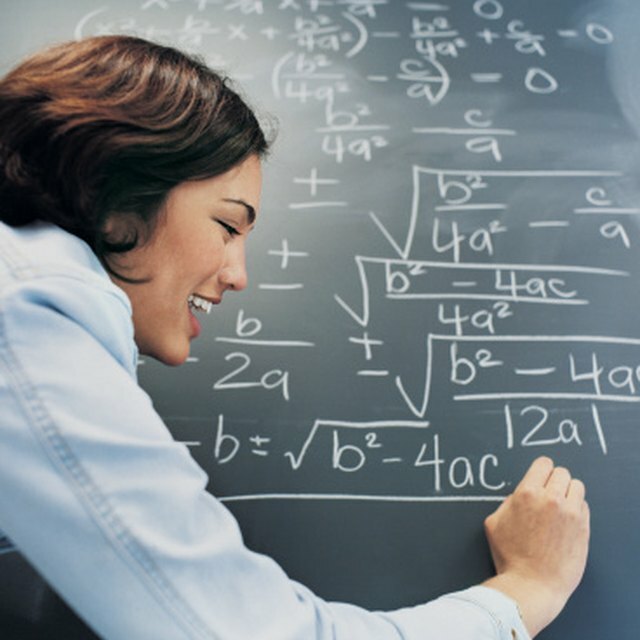 High school can be the time when students begin to struggle with different math concepts. This can be especially troubling for you as a parent if you cannot afford a math tutor for your child. Fortunately, you can use the Internet as a free resource for learning high school math. Two websites in particular (see Resources) offer a plethora of lessons and explanations regarding high school math. Whether it is algebra, geometry or calculus, you can use these websites to learn high school math online. Log onto the High School Ace website (see Resources). Click the “Math” link located in the “Subject Guides” box. Scroll down the next page to find lessons for specific math subjects. Links will be separated by “Algebra,” “Geometry,” “More Math Stuff” and “Trigonometry.” Click on one of those links and you will be directed to a new webpage. Scroll through the links on the new webpage to get to a specific lesson. For example, if you clicked a link under the “Algebra” heading, you may find yourself on a webpage with links that will take to lessons regarding functions. Click on one of the links and you will be taken to the high school math lesson. Visit the Appetizers and Lessons for Mathematics and Reason website (see Resources). Find the links located in the “How-Tos/Reference” box at the top of the page. Here you will find links such as “Algebra,” “Geometry” and “Calculus.” Click on one of these links. Read through the next page to get an introduction to the subject. You will also find lesson links posted throughout the page. Click on one of those links to get to the lesson. Use the text box in the top right corner of the website to search for specific high school math lessons. For example, you could type the words “Pythagorean Theorem” in the box. Click the “Search” tab beneath the box and you will be taken to a results page with links regarding the Pythagorean Theorem. Click on one of those links to access the lesson. No online high school math lesson should ever replace actual high school courses. These websites should be used along with high school math classes in assisting students to learn high school math. Smith, Andrew. "How to Learn High School Math Online." Sciencing, https://sciencing.com/how-to-learn-high-school-math-online-12753044.html. Accessed 25 April 2019.